Seagate has announced a partnership with DensBits, an Israeli company whose "revolutionary" memory controller design may prove useful for upcoming solid-state drives. Seagate made an undisclosed investment in DensBits, stating its plans to improve both consumer and business-class products with "significant cost savings, extremely high reliability and unparalleled performance". The storage company suggests it will release a "consumer grade" SSD with 3-bits per cell (TLC) while saving 2-bit designs (MLC) for business applications. TLC, or triple-level-cell, is one of the reasons SSDs have plummeted in price, recently. 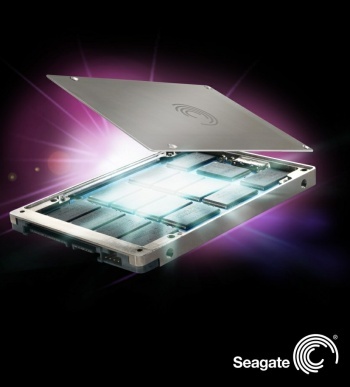 Interestingly, Seagate has a history of being hostile to solid-state storage technologies. The company has criticized Apple for envisioning a HDD-less future and even threatened to sue SSD chip makers for patent infringement in 2008. Just a month later, Seagate made good on its threat and launched a lawsuit against chip maker STEC. Seagate eventually dropped the lawsuit, but adding insult to injury by stating that STEC's sales were so miniscule it simply couldn't justify pursuit of the matter. During the same year as the STEC lawsuit, Seagate announced its intentions of releasing a line of enterprise-level SSDs. In the time that followed, not only did Seagate release its enterprise SSDs, but the company also began touting its hybrid drives which aimed to provide the best of both worlds -- large capacities at reasonable prices with a slight bump in speed afforded by the accompaniment of solid-state chips. In a recent interview, Seagate CEO Steve Luczo points to flash storage's exorbitantly high premiums versus traditional mechanical designs. While it's difficult to disagree with Luczo's claim, change seems to be in the air. In just the past year, we've seen a precipitous drop in cost per gigabyte for solid state drives. Prices have basically halved in the past 12 months. It is interesting to note that research firm In-Stat predicted in 2006 that SSDs would overtake HDDs in 2013. Although the exact year this will come to fruition remains in question, rapidly falling SSD prices coupled with a reinvigorated interest in ultra-portables may help define 2013 as the year of SSDs.